But Hopefully will be available in the future. Purchase all your organic nutrient needs from New Creations Farm. We are a Great Grow Distributor. 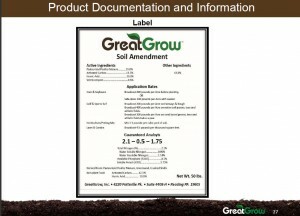 Call Randy at 570-441-6341 for info and to place an order for GreatGrow Soil Amendment. Soil Amendments create Healthy Soil. They are applied to dirt where they create soils that produce higher crop yields with more nutritional content when compared with agricultural soils not using GreatGrow products. The Soil Amendments provide a consistent microbial quality and quantity, unlike compost and compost based products which we find vary greatly in microbial quality (aerobic as compared to anaerobic) and quantity. The properties of our soil amendments enable the beneficial, aerobic biology in the soil to convert anaerobic soil conditions into aerobic soil conditions. Aerobic soil provides the growing conditions that plants such as crops, floriculture, turf, and vineyards require. Anaerobic conditions promote the growth of plants that we generally consider to be weeds and are subject to creating soil compaction. Conversion of poorly aerated soil to well aerated soil is required to improve the health of the soil. Healthy soil promotes the growth of healthy plants which, in turn, have greater nutrient uptake and are less susceptible to the harm caused by disease and extreme weather conditions. The “safe harbor” environment provided by the granules enabled by this method of introducing new microbial life is very effective as a means of introducing new microbial life. They do not adsorb highly soluble synthetic chemicals which would harm the beneficial biology. 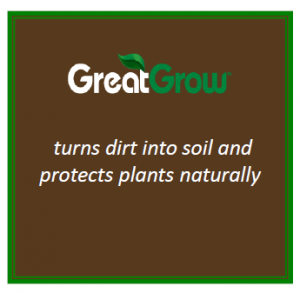 Toxic soils often can be remediated on-site with the use of GreatGrow’s Soil Amendments in conjunction with GreatGrow’s Dry Mix Foliar Sprays when used as soil drenches. Healthy soils with an active, aerobically behaving microbial population can reduce the leaching of nitrogen compounds into ground water, enabling the soil to increase its water and oxygen holding capacity. These microbes break up soil compaction while keeping the soil flocculated. Great Grow products restore aerobic-behaving, beneficial microbes to soils of all types. The identification of these organisms and their behavior patterns are the result of Dr. Elaine Ingham’s lifetime research. Dr. Ingham is credited with the development of the science defined by the interrelationships among the variety of essential organisms that complete the Soil Food Web process and the Nitrogen Cycle in the soil. This is described in the USDA publication, Soil Biology Primer, six (6) of whose eight (8) chapters are authored by her. She is internationally recognized as the leading microbiologist whose efforts comprise the ground work for today’s microbiology research and practices pertaining to soil, plant health and performance. She has worked with Great Grow’s Founder and President, Stanley Thornton, for the past 12 years in his successful effort to commercialize her science. Science Sets Great Grow Apart from Everyone Else.